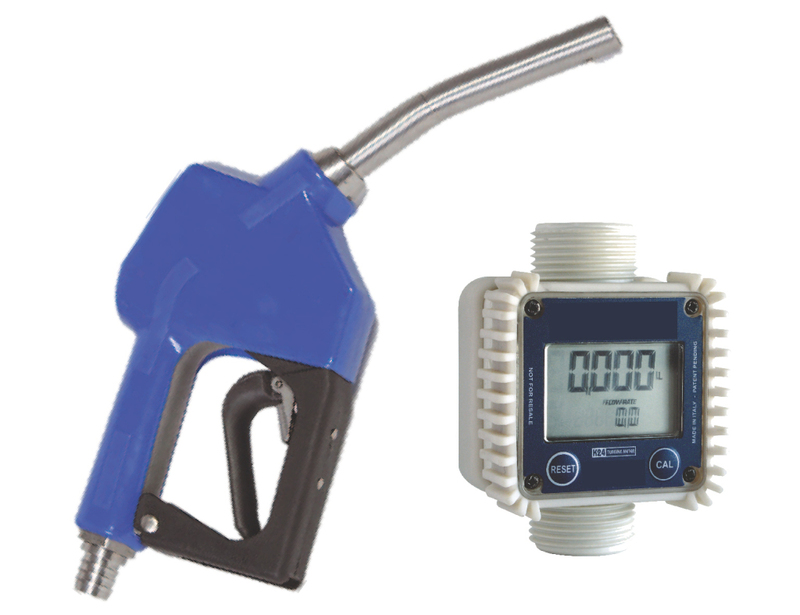 D&H’s Adblue Pumps and Tank range of High Quality innovative products includes Pumps and tanks for dispensing ADBLUE™. Blueplus is a registered trademark of excon pump solutions which is now part of the D&H Group. Whether you are storing or dispensing Adblue from small containers or drums and IBC’s or whether you buy in bulk, we have the Ideal Adblue pump and tank solution for you. Our Adblue electric pumps are very reliable and have a 2 year warranty. We also supply a wide range of Adblue accessories including Drum and Tank adaptors, Hose sets, Flow meters, and stainless steel fittings. please give us a call today with your requirements. What AdBlue Pump system do I need? Manufactured from PVC with PTFE (teflon) Valves. Do not operate any pump on a closed head. 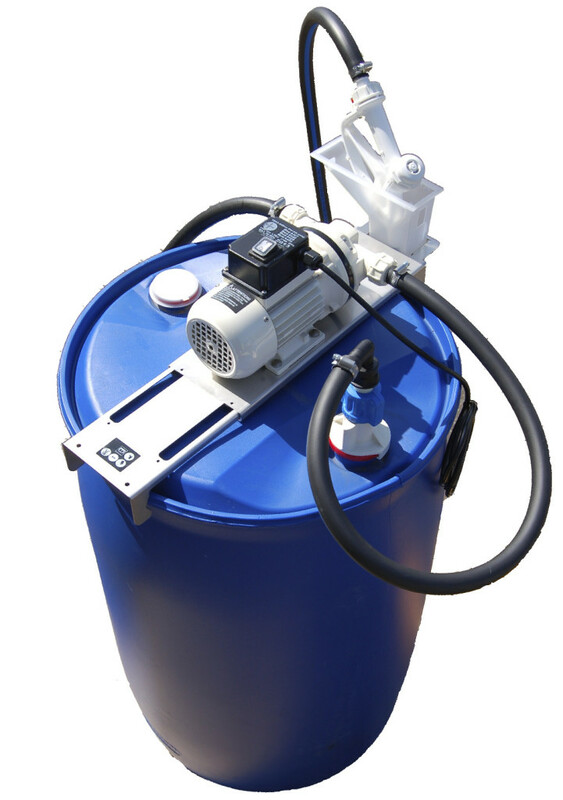 Self-priming piston pump designed for transfering Adblue from 20 litre – 200 litre drums. It delivers a generous 330ml per stroke. It has an anti-drip nozzle. 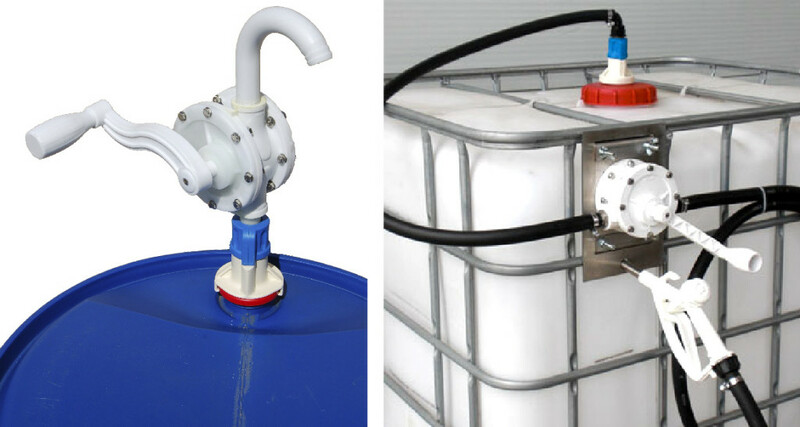 High quality Polypropylene and Polyethylene construction that fits 1000 litre IBC’s and 200 litre drums of Adblue. Patented piston less direct lift pump. There is almost no mechanism to fail, jam or wear out. The pump has 2 working parts in the form of flap valves which do not take excessive loads or pressure. Delivers AdBlue on both Up and down stroke. Anti drip spit. The spout rotates to prevent dripping. 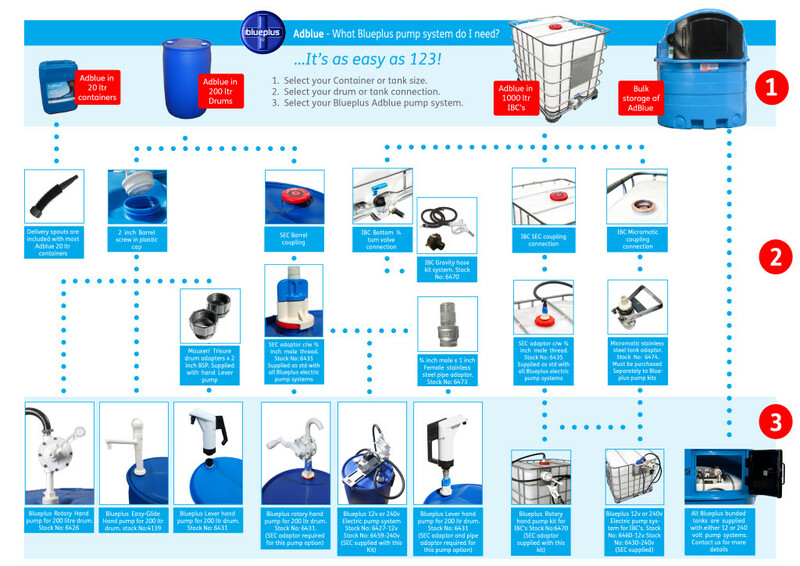 Provides a easy and quick way of dispensing Adblue from 1000 litre IBC’s. The kit connects to the bottom outlet (valve) of the IBC. 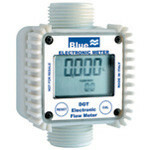 Blueplus electric pumps are self-priming and available in 12 volt and 240 volt. Designed to pump 35 litres of AdBlue per minute. The motors are protected to IP55 and are compact and easy to operate. 1″ x 20mm Hose barb connections. On/off switch on motor casing. 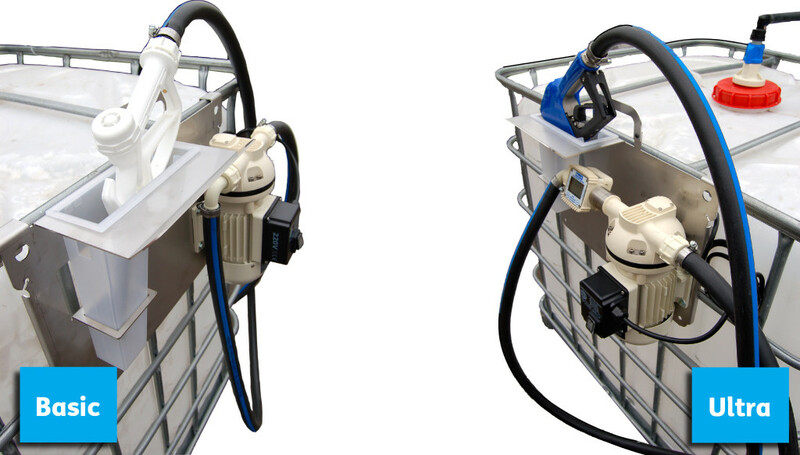 This neat 200 litre drum pump kit is compact, easy to set up and operate. The kit includes; 35 L/min Adblue self-priming pump (12 volt or 240 volt), Suction hose c/w SEC adaptor to connect to top of drum, 4 metres of dispensing hose c/w manual polypropylene nozzle. This kit is fixed to a stainless steel mounting bracket which sits securely on the drum. Blueplus stainless steel automatic cut-off nozzle and flow meter available as an optional extra. 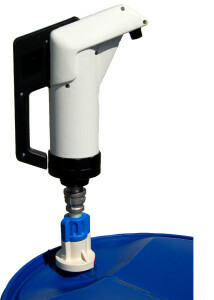 The Basic Blueplus IBC Pump system is aailable in 12 volt and 240 volt. The stainless Steel IBC Side mount system fits securely on the side of the IBC. The Ultra Blueplus IBC Pump system is the professionals choice. The ultra kit will transform an IBC into a premium dispensing system, with its heavy duty stainless steel automatic shut-off nozzle and digital flow metre. This is a popular choice for regular uses of AdBlue. 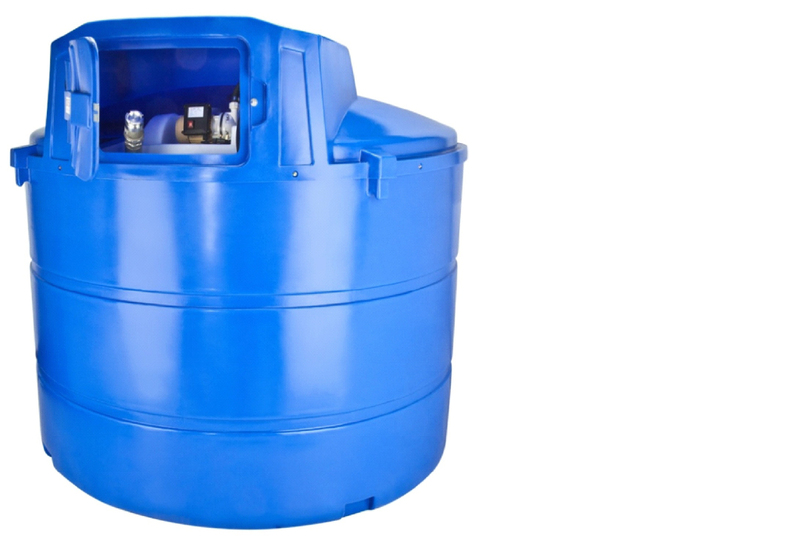 When purchasing AdBlue in IBC’s or 200 litre drums, it is important to know what type of Tank/ drum adaptor is supplied with your delivery of AdBlue. IBC’s are supplied with any of the above connections. A. This connector is called a SEC adaptor formally known as a CDS adaptor. All Blueplus electric pump kits include the SEC Adaptor/ coupling as standard. B. Some manufacturers use a Micromatic adaptor, which requires the correct Micromatic stainless steel coupling. 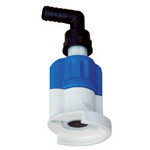 The micromatic fitting must be purchased separately to the range of Blueplus electric pump kits. C. IBC’s can be supplied with a S60 outlet valve installed at the bottom of the tank. 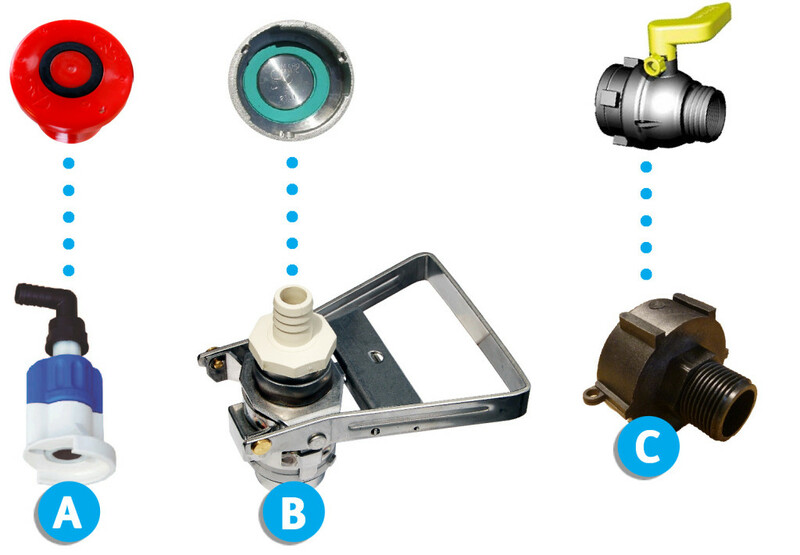 An valve adaptor kit must be purchased separately to the pump range. Ideal for refuelling Vehicles ‘on the move’ with adblue. 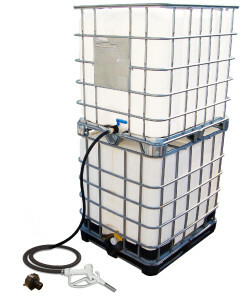 This 200 litre Transportable tank is desined to fit on the back of a pick-up truck or trailer. Fitted with a 12 volt pump c/w battery leads, and dispensing system. The tank is made from MDPE (medium density Polyethylene) which means the tank is very stong yet lightweight. The safe and recommeded solution for storing and dispensing Adblue. 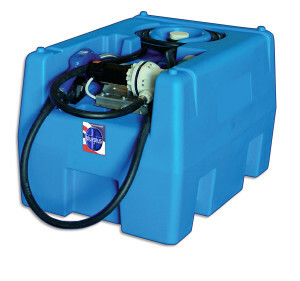 Our Adblue tanks are fully bunded and available in 4 sizes from 1340 litre to 5000Litre. These tanks are popular for customer who purchase adblue in bulk loads. 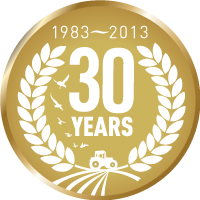 They all feature alock system for maximum security and all pump equipment is manufacured to the highest standards. Robust MDPE Tank and bund construction. 35 L/min AdBlue pump c/w on/off swich. Stainless Steel Automatic cut-off nozzle. Todo 2″Stainless Steel fill point. Easy to install, in line or at the end of the delivery hose, this unit is compact and features a easy to read digital display. Its simple turbine technology makes this unit reliable. Inlet and outlet connections are 1″ BSP and 1x 1″ Stainless steel coupling is supplied with the kit for connecting to a pump etc. It is sutable for both gravity and pumped systems. Inlet: 1” Male BSP. Outlet 1” Female BSP. Meter body can be rotated to suit different pipework configurations. Only sub total is resettable. 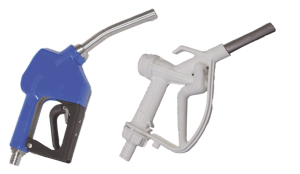 Two options of Adblue dispensing nozzles are available. The standard basic manual polypropylene nozzle with 20mm hose connection and the premium Stainless steel automatic shut-off nozzle. Both are designed specifically for Adblue. The manual nozzle has a lock off facilty and is manufactured to the highest standard. 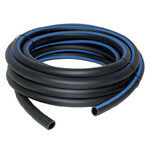 Premium PVC Flexible AdBlue hose is suitable for both suction and discharge applications. It is reinforced which gives it strength yet is very easy to use and store away when not in use. We specialise in supplying a range of Tank systems to suit large ADBLUE users. 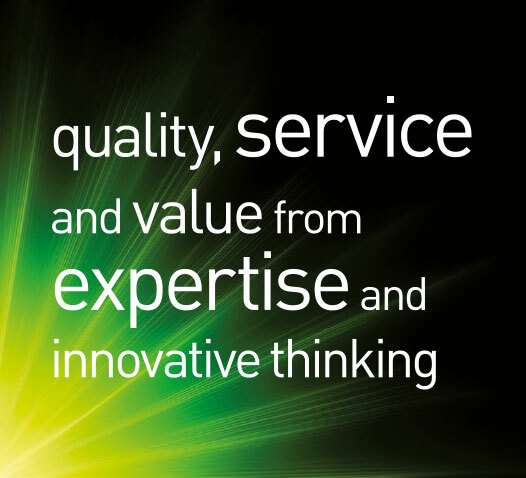 Please contact our technical team today with your requirements.